I can’t remember where I saw the statistic, but there is something like two or three blogs started every minute. I’ll let you do the math, but suffice it to say, there are a lot of blogs out there. When I started my first site a little over two years ago I had no idea what went into starting a blog, just that it sounded like something I’d enjoy. Fast forward two years; I’ve bought one blog and started another to add to my portfolio. Depending on what goals you have for your blog, there can be a variety of things to consider. If you’re thinking about starting a blog hopefully these tips help. 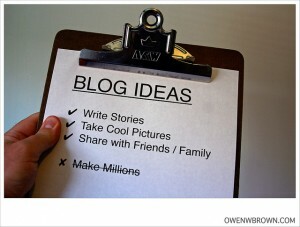 With that out of the way, my first tip for starting a blog is determine what your goal is. Are you writing a digital journal? Are you wanting to interact with other like-minded individuals online? Are you trying to help others as you share your personal journey? There are many other things you can focus on as well, the point is to determine the purpose of your blog and why it exists. Combine that with developing your voice and you’ll have a good foundation. It used to be that a great domain name was incredibly important. That’s not as much of a case anymore. Of course, if it’s a good name then it can help you stand out. Once you find a good domain name, there are a variety of sites where you can register your domain name for relatively cheap. Regardless of the name you come up with, the point is that it’s not the most important thing when starting a blog. While it can tell readers a little about what your site is about, don’t vex over a site name. With so many blogs on the internet it’s easy to get caught in the trap of comparing yourself to others. I get it, we all go through a peer pressure; heck, I do it myself at times. While comparison can be good to motivate you or even challenge you, make sure to stay true to your goals. This is where the goals you have for your site become important. If it’s to grow your site then you’ll want to market yourself through things like commenting on other sites and being active on social media. Beyond that, you’ll want to focus primarily on content as that’ll be what brings readers back. Be yourself in your writing and let that come out. If you do that the rest will come in due time. Most importantly, remember that blogging is what you make of it – so don’t forget to have fun!